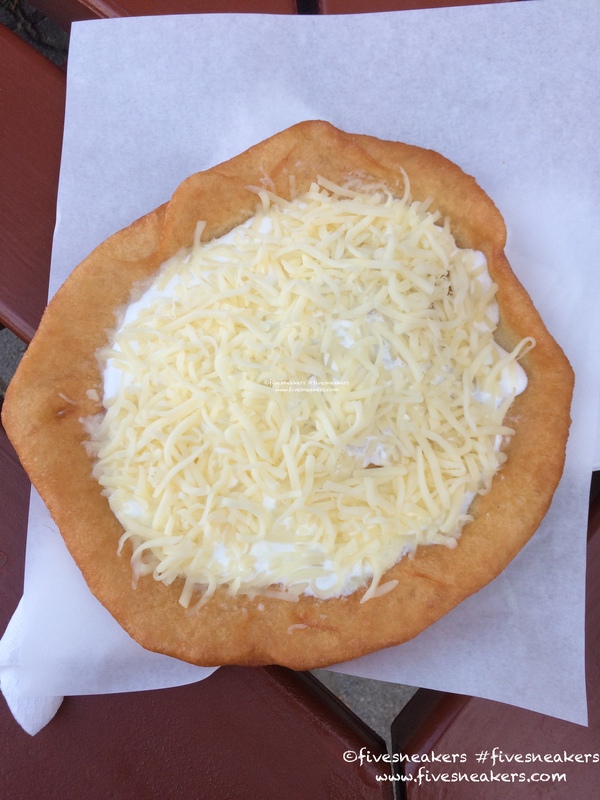 Lángos is a very popular Hungarian street food speciality. It is a deep fried flatbread. 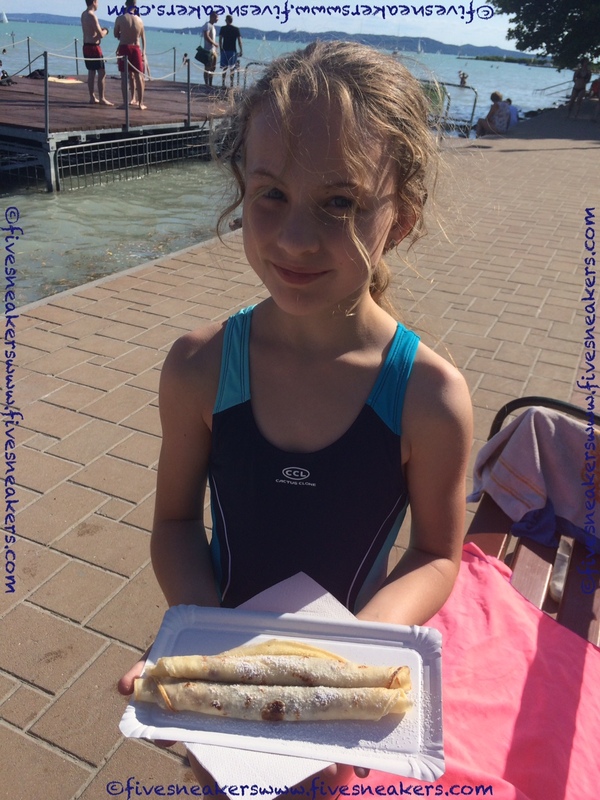 Number one beach food at Lake Balaton. Traditionally lángos is baked in front of brick oven close to flame, so the basis of its name „láng” means flame in Hungarian. 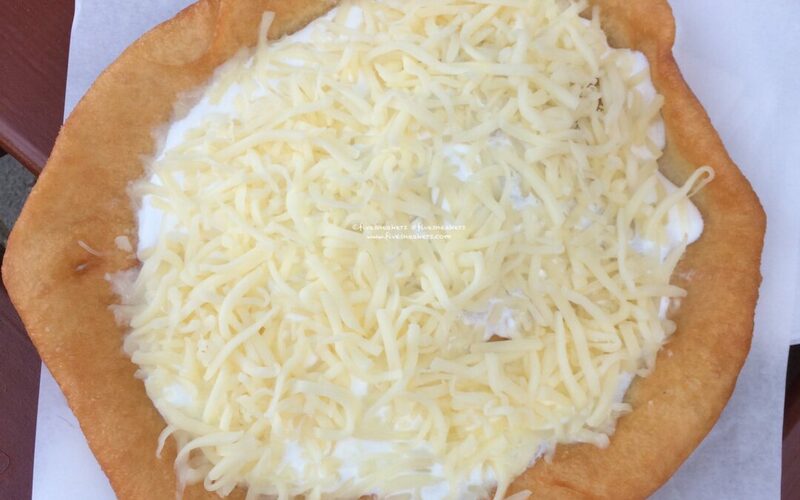 Water or milk, flour, yeast, sugar, and salt: that makes the dough for lángos. Adding sour cream, yogurt, or mashed potato the dough is optional. 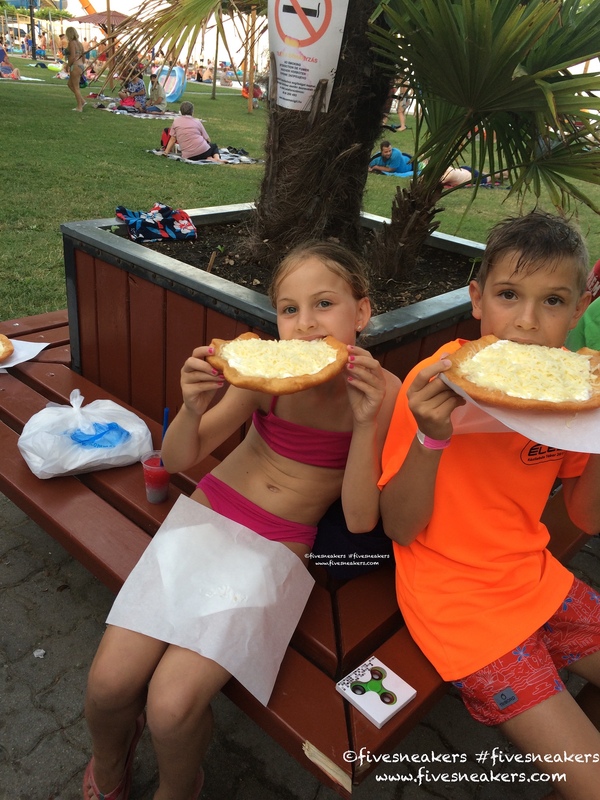 We eat it fresh and warm, topped with sour cream and grated cheese, garlic or garlic water. Or simply with salt. 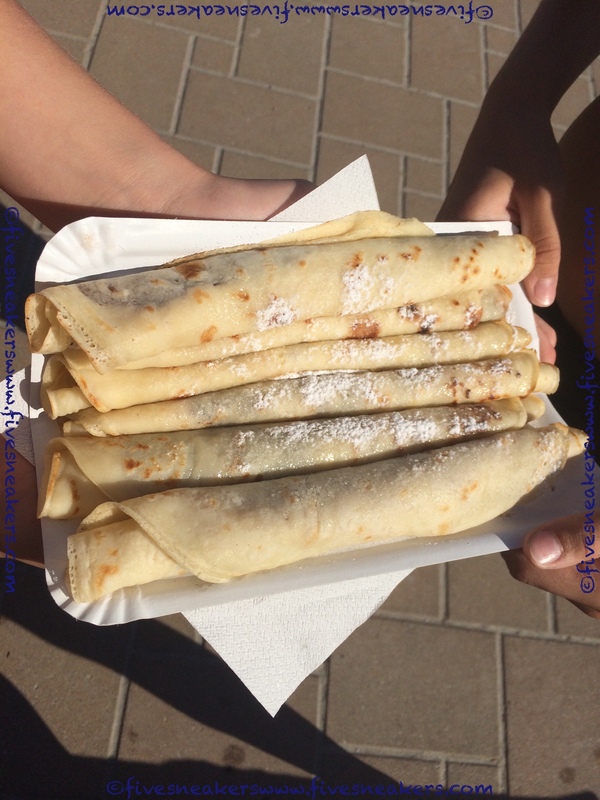 Palacsinta is a thin pancake similar to the French Crepe. There is one main difference between the French and Hungarian versions of the dish. You can use the mixture for ‘palacsinta’ straight away. Unlike that of crepes, which rests for several hours before use. We eat palacsinta in a wide range of varieties, both sweet and savory. Palacsinta can be an appetizer, a main course or a dessert. It is another favorite beach food. The ‘beach-palacsinta’ are traditionally rolled with jam, cocoa, hazelnut-choco cream (called Nutella) or curd covered with powdered sugar. A well-known Hungarian version of palacsinta is the ‘Gundel palacsinta’. Add ground walnuts, raisin, candied orange peel, cinnamon and rum filling, serve flambeed in dark chocolate sauce. Voilá, you made the mouthwatering Gundel palacsinta. ‘Hortobágyi palacsinta’ filled with ground meat, sprinkled with sour cream can also be a main course. It is a very popular meal. Beach food booths usually make it of seafish and not fish from the Balaton. The chunks are dipped into peppered flour, then deep fried. 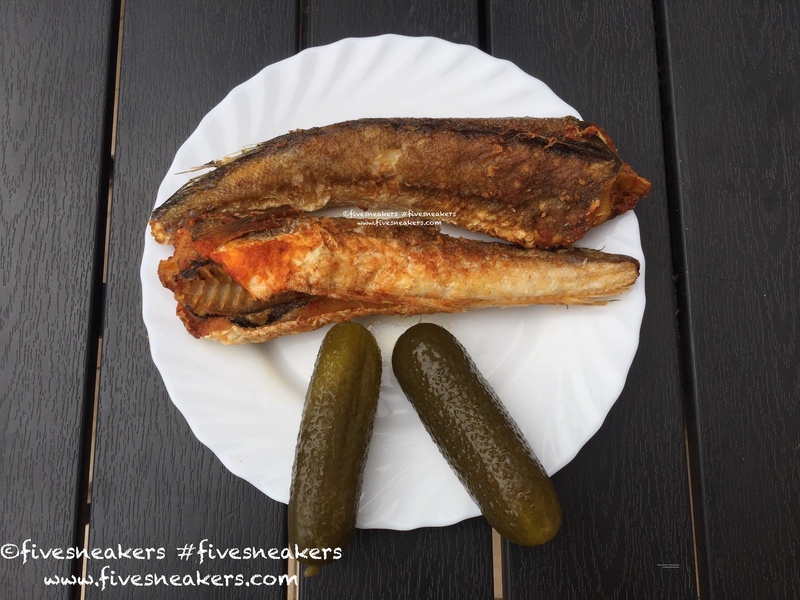 Traditionally we have it with bread and pickles. The authentic way of having this dish is taking bread and pickles as sides. Ms Purple’s favourite. You can buy it at major beaches and throughout Hungary. The etymology of the name refers to a stovepipe, since the fresh, steaming cake looks like the shape of a hot chimney. 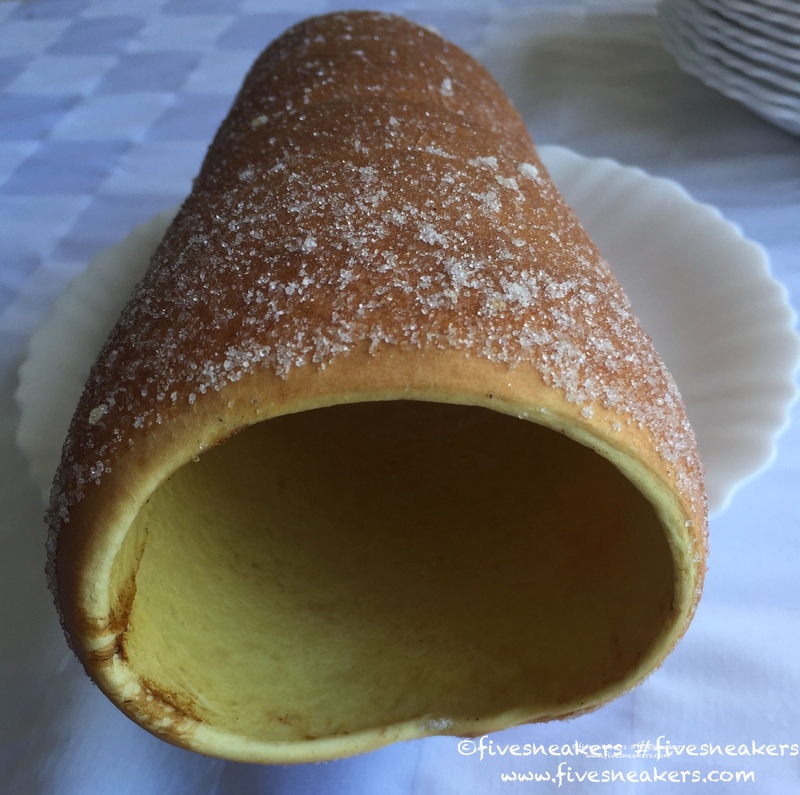 The base of Kürtőskalács is the sweet yeast dough, of which a strip is spun. Then one wraps it around a truncated cone-shaped baking spit, and rolls it in granulated sugar. During the baking process the sugar stuck on the cake caramelises and forms a shiny, crispy crust. Additional toppings can be: vanilla flavoured sugar, cinnamon, cocoa, cocos or chopped walnut.